Al Gore's internet is a wonder to behold! I came upon a site, by accident, that convinced me that we can all throw away our maps...forget the GPS lady....and just ignore your spouse who is making noises like, "you're driving in circles and don't know where you are....etc." Relax. Just stop in at the nearest filling station or convenience store and pick up a can of RC Cola! If your can on the far left looks like this one, you're in Columbus, Ohio. If it's a white can you're in the mountains of Louisville, KY. If it has white stripes around it like the middle can, you're in Holland, Mich. If it is narrow and has a yellow stripe around the top, you're in Chicago. And if it looks like the can on the far right...with a red stripe around the top......you've arrived safely back home in Charlotte. The 15th annual RC and Moon Pie Festival was held last week in Bell Buckle, Tennessee and witnesses say that it was the best one yet! 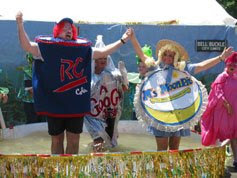 Since we cronologically challenged Wildcats are not due for another reunion for another 5 years or so, I'm going to suggest to the Reunion Commttee that we all meet next June for the RC and Moon Pie Festival. There's fun for everyone beginning with the RC Moon Pie parade followed by the Moon Pie Toss and the RC Dash. For those of us less athletically inclined there's Syncronized Wading. All in all, according to the Bell Buckle Chamber of Commerce "it's a day of fun for young and old celebrating THREE southern traditions: RC Colas, Moon Pies and Historic Bell Buckle, Tennessee...where we are 100 years behind the times and proud of it." I don't know exactly when this old RC Cola bottle was used, but when I saw this picture....it was like a "time machine" transporting me instantly to another time...and another place. It seems that I was suddenly about 6 years old sitting in the dining room of our house on East 5th Street drinking a "coke." (We alternated between Cokes, Pepsis, and RC's....depending on which was on sale at the A&P.) We called them all "Cokes." I believe it was those yellow pyramids that set off that journey in my mind. The feeling only lasted for a split second...but it was powerful. But, of course, the explanation could be a very simple one: creeping senility, first signs of dementia, or perhaps the pyramids I was thinking about were really the ones on that pack of Camel cigarettes....that made me so sick. "You know you're getting old when you stop to tie your shoes and wonder what else you can do while you're down there.